AIADMK supremo Jayalalithaa on Wednesday alleged that Tamil Nadu was fast becoming a haven of the banned LTTE and asked the Centre to take stern action in the interest of the nation's security. She said the recent arrest of LTTE cadres and their associates had vindicated her charge that terrorists had infiltrated Tamil Nadu and the law and order situation had deteriorated. The confessions made by the arrested cadre that they were hiding in Tamil Nadu and secretly carrying out their works had shocked the entire country, she said in a statement here. Jayalalithaa said a Sea Tiger, naval wing of the LTTE, had also confessed that 'Viduthalai Chiruthaigal' (a dalit outfit) leader Vanniyarasu was functioning as an LTTE agent and was indirectly aiding the outfit. "I was labelled anti-Tamil when I revealed that there was a nexus between the LTTE and some political leaders in the state," she said in a statement here. When Vanniyarasu was arrested in October last on the charge of supplying computer spare parts to the LTTE, Viduthalai Chiruthaigal president Thol Tirumavalavan called on Chief Minister M Karunanidhi.On the same day, Vanniyarasu was released on bail, she said. "As Viduthalai Chiruthaigal is supporting the minority DMK Government, he was immediately released. It only shows that Karunanidhi is directly offering support to the LTTE." 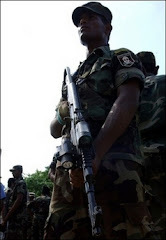 Stating that the LTTE's activities were being continued in the state without any hindrance,she said it would become a haven of the Tigers,posing a threat to the nation's security. As the law and order situation would not improve in Tamil Nadu under the DMK Government, the Centre should take immediate action, she said.